The tradition of the chocolate rabbit has its origin in the ancient Teutons who believed (according to various legends) that Easter was the rabbits who hatched the eggs. Hence the Easter-Rabbit link, and hence also the custom of parents hiding chocolate eggs in the garden or in the house and children having to look for them on Easter Sunday. The bonding of the egg with spring and with Easter comes from centuries ago. Some sources date back to the 4th century. In different cultures, the eggs represent "life" and "fertility". Both in Rome and in Greece, painted eggs were given at festivals and spring festivals. Likewise, the egg in the Christian tradition has the meaning of a "new life" meaning the word Easter. Traditionally, the Catholic Church did not recommend the consumption of eggs during the Lenten season, which generated a surplus of eggs that required an adequate conservation method to avoid its waste. In this sense, they were coated with a thin layer of wax that prevented deterioration. On Easter Sunday, the first day on which eggs could be eaten, the custom of sharing or giving away eggs that had not been consumed during Lent began to spread. This custom was consolidated to such an extent that in the twelfth century the Church blessed the custom of giving eggs after the Easter Mass. A custom that has been maintained until recently, especially in rural areas, where grandparents and godparents delivered to the godfathers bagels with two eggs to be blessed. And then the chocolate arrived ... From the 18th century, when the chocolate industry achieved important advances in the handling of chocolate, it began to empty the fresh eggs and fill them with chocolate. Later, other figures copied from the Austrian school appear in different colors and shapes. It is this tradition that evolves, in turn, towards the custom that is most rooted in Catalonia: the elaboration of chocolate figures to celebrate Easter, in some cases, authentic sculptures whose only limit is the imagination of the master chocolatier. And the Easter rabbit? 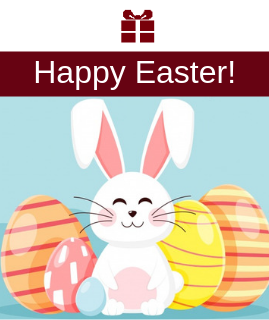 The tradition of the chocolate rabbit has its origin in the ancient Teutons who believed (according to various legends) that Easter was the rabbits who hatched the eggs. Hence the Easter-Rabbit link, and hence also the custom of parents hiding chocolate eggs in the garden or in the house and children having to look for them on Easter Sunday.